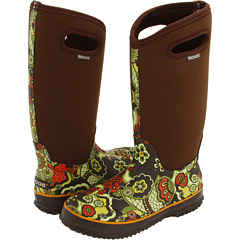 Gear Review: Bogs Women’s Boot | Shes a ManiYak! ← Is it Really January? A couple of months ago the Outdoor Blogger Network had a gear review give away opportunity for one pair each of men’s and women’s Bogs® Boots. I threw my name in the hat and crossed my fingers for a win since I had been shopping for a good, warm pair of boots to use in my winter kayak fishing trips. Unfortunately, the RNG (random number generator) didn’t smile down on me that day. FlyFishilicious author Jen K. was the lucky winner but within thirty minutes of that announcement I was on-line, ordering a pair of Bogs® of my very own. With many options to choose from I opted for the Women’s Classic High Paisley. For better or worse I’m a child of the 60’s and I like a little color when I have a choice! I put them though the first test two days after they arrived when we received a record-breaking 3+ inches of rain in less than forty-eight hours. I’ve always hated having damp socks, it’s just a miserable feeling. That certainly wasn’t an issue as I slogged back and forth to work in my new boots, but that’s pretty much a given isn’t it? The real test came a couple of weeks late when I got to break away for a day and throw my kayak in the water to do some fishing. It was 32 degrees when I started the morning but it was climbing into the higher forties as the day progressed. I was heading to my favorite spot on Elkhorn creek so the put-in would have me wading in some shin deep water. Last winter I got chilly feet more than once after making this launch. On this day my feet stayed dry and warm. I was even able to turn sideways on my kayak (a most comfortable way to sit) with my feet dangling in the water. They’re not kidding when they say they’re good to go in sub-zero temperatures. 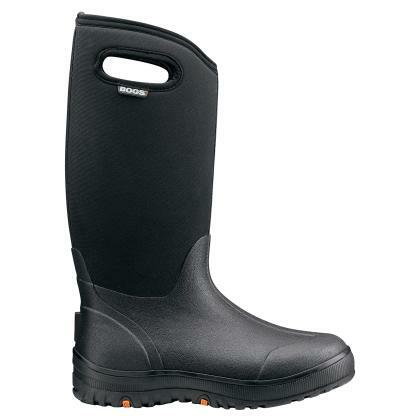 Over all, I have to give my Bogs® boots a solid rating of 5 stars! They’re comfortable, well made, sturdy, dry, and warm. This entry was posted in Kayak Fishing, Product Reviews and tagged bogs boots, boots, Elkhorn Creek, Kayak fishing, Kentucky, yakangler.com, zero temperatures. Bookmark the permalink. I like the paisley too! Very stylin’! And they even have them in my tall size…Haha. Nice review.